My parents always say it's never wrong to dream. What is wrong is to limit myself by being scared to dream big dreams. When I was young as I devoured a novels upon novels of romance set in English regency period I used to vow to myself that I would someday set foot on England I did not know then how that could happen. How a skinny, brown-skinned girl who grew up in squatters area could possibly travel to England - fly out of the Philippines even. But you know what, it did happen. And God is amazingly good because I was able to go to England for free and live there for 2 years! (I was sent there by my then company as a software developer for British government projects). That was definitely one check!, one fulfilled dream among my long list of big dreams. 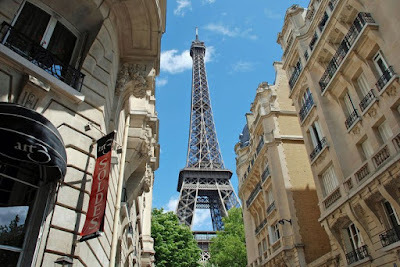 The next must-visit destination on my list was France - specifically the City of Lights. Last January of this year I received a notice from KLM (the airline I used to fly with during my trips to/from the UK), warning me that my miles were expiring by end of July. Just out of curiosity I tried booking a flight to Paris for two with the miles - lo and behold it got through! I told my husband that hey, I've got tickets now for Paris all you have to do now was to get us some visas.Then everything soared from there as it turned out my husband was more excited (if that's possible) about the vacation. We even both decided to throw in Italy, specifically Venice, Rome and Florence, (para sulit na) into the plan. On the 8th of July we embarked on a trip of a lifetime. The moment we arrived at Charles de Gaulle (though it did not look as impressive as I had thought) I had goosebumps all over my body as realization sunk in that I was finally, really there. I couldn't then shake off the silly grin from my face all throughout the trip. We got lost many times as we tried to make out the guidebooks we bought, always the first purchase we made as we entered a city. We were the typical tourists - cameras slung on our necks, map folded and unfolded hundred times for dear life. No doubt sporting a look of perpetual silliness as we wandered every city we visited, trying to decipher the street signs and metro maps. But we also tried to look cool by clutching a bottle of wine as we "wander". It was a magical adventure. A trip that I will never forget, ever. Furthermore it was another big dream come true. I never felt so humbled by His generosity. 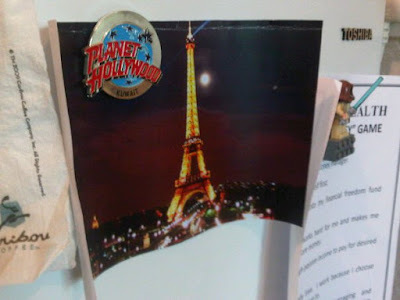 A printed copy of the Eiffel tower posted on our ref to psyche myself that I would visit the real thing someday. P.S. The print-out is a good idea. I'll post one in my room soon.